This economical, stat filled baseball game boasts a price that’s even lower than previous installments at $19.99. Not bad for a Wii title. The graphics and overall production values could use improvement, but the game modes have nice customization/coach options with a low learning curve so young ones can enjoy big league fun on their level. All Major League Baseball teams are included with rosters that have a pro player from every team including Ken Griffey Jr., David Ortiz, Alex Rodriguez, Daisuke Matsuzaka, and Ichiro Suzuki. 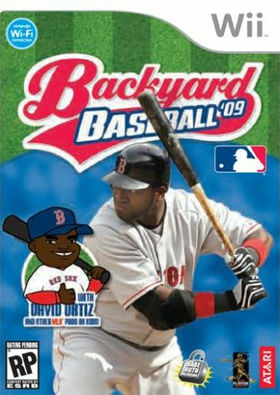 The 11 backyard teams include neighborhood kids Pablo Sanchez, Joey MacAdoo, Ernie Steele and Tony Delvecchio. Customizations like player trades add some appeal while the stats are a low-cost way to offset other production values (e.g. small button graphics make it hard to distinguish an “A” from a “+”). The graphics include a helpful ball trail so you can track the path plus some shadows and butterflies to give the environments some life. It would have been nice to see some interactive bonuses when you hit objects outside the field like buses and moving cars, but maybe that’s not a responsible example for the kids. The six modes of play have a Play Now and Pickup Game, which allows team, player and stadium choice (a limited cache which could be expanded in the next version, especially the darkly lit ranch venue). Tournaments allow as many as eight players. Use the 1 button for scouting reports or the 2 button to simulate through a game. Season Game mode has unlockable players when players complete a 16 or 32 game season. Individual player statistics, awards and other milestones accumulate in each game, season and total career. In the Home Run Derby, ranging from two to four players, the game tracks stats for distance, frequency and total distance. This mode is great for batting practice but needs more player incentives. The American/National League All-Star Game automatically picks the players, but the lineups are different each time. The controls promote lots of physically active movements as well as button options (e.g. pressing A to swing the bat instead of waving the remote). Wii Sports veterans can easily adapt to these nice mechanics. Timing is paramount in the batter’s box. Players must spend some time adjusting to the response timing and zone adjustment when batting. The batting hit range is expanded so it’s easy to make contact, but results in some odd mechanics and graphic delays. The control biggest change is the new Nunchuck use for movement. Using the directional pad for defensive throws and the occasional base run works, but the Nunchuck provides some smoother gameplay and is nicely incorporated into the pitching scheme. Use the Nunchuck on defense or offense for special actions (z button), which can total up to eight at a high performance level (check the meter at the bottom of the screen). Offensive and defensive power ups add some gameplay variety. Their colorful and self-explanatory names include the screaming liner, slime ball, freezer and zigzag. Pitchers can also throw out runners leading off the base. Sunny Day (voiced by Samantha Kelly) and Jack Fouler (voiced by Jim Curtis) are the announcers (their volume can be reduced to zero); environmental sounds, effects and on field chatter all overlap at times. Other unique touches include mini games including a useful strike zone graphic and other graphic aids minimize the frustration level. AI players take a lot of risks, which might exist to give players plenty of chances to catch up…who doesn’t like to win? For the money, this title has decent replay value and appeal for casual gamers and beginners. Recommended with a few reservations (**1/2 out of four stars). This entry was posted in Video Game Reviews and tagged baseball, Michael Siebenaler, Mike Siebenaler, Tall Writer, video games. Bookmark the permalink.